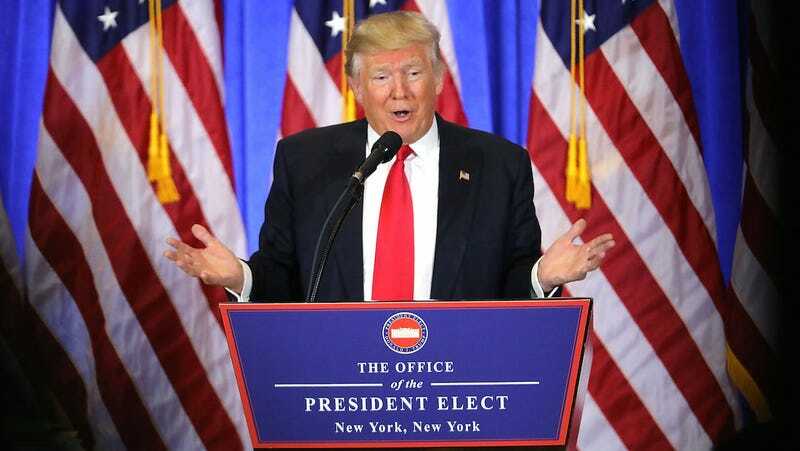 President-elect Donald Trump went after drug makers and sent biotech stocks plummeting after calling the drug industry “disastrous” during his first press conference since the election. The pledge to overhaul Big Pharma isn’t exactly a new one. During his campaign, Trump promised to crack down on high drug prices and endorsed the idea of having Medicare negotiate drug pricing—a position that has in the past garnered Democratic support and Republican opposition. After Trump’s remarks, the Nasdaq Biotechnology Index fell by more than 3 percent. The statement sent drug makers, who were hopeful that a Republican White House and Congress would mean friendlier policies, reeling. While the particulars of how exactly Trump would go about making good on his promises are still unclear, it’s likely that this is an issue that he would find support for across the aisle. His remarks, in fact, won him an unlikely ally: afterwards, Bernie Sanders said during a Senate floor speech that Trump was “exactly right.” And his comments, some have noted, also strike a familiar chord to Hillary Clinton’s comments on price gouging during the presidential campaign. Drug pricing in the US is an opaque business, and the rise of populist politics has made prescription drug pricing a hot-button issue that has apparently reached the top of Trump’s agenda. Anticipating populist pitchforks in the wake of Trump and drug-pricing scandals like that of EpiPen, some companies have gone on the defensive, pledging to limit price increases to 10 percent each year. And on Wednesday, it seems, the drug industry heard Trump’s words loud and clear.